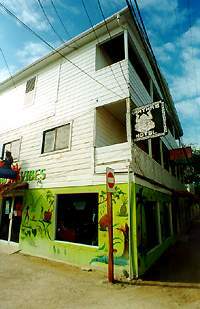 Martha's Hotel "Our Belize Vacation" - "Our Belize Vacation"
We started in 1982 offering nice clean rooms with private baths. Now we've expanded to 12 rooms and an office for all your needs. Although we are centrally located just three blocks down from the air strip, we are one block from the sea. We don't have a cafe and still restaurants are within walking distance from us. We provide fresh ice water in our rooms daily. Telephone & Fax Services available in our office during normal working hours. We try our best to make you feel at home! Martha's Hotel...Where stopping by becomes a must. Unbeatable prices all year round with taxes included already. Monthly rates available upon request during slow season only Lots of San Pedro for just little money to fit your budget.